Smriti Shriniwas Mandhana is a professional Indian cricketer who plays who plays for the Indian women's national team, was born on July 18 1996 in Mumbai, Maharashtra, India. She is a left handed opening batswoman who can also ball part time right-arm medium pace as well. In June 2018, the Board of Control for Cricket in India (BCCI) named her as the Best Women's International Cricketer of this year. She also received the honourable 'Arjuna Award’ earlier this year. Mandhana's family is closely involved in her cricketing activities and supported her well which took her to such a level. Her father Shrinivas, a chemical distributor, takes care of her cricket programme while her mother Smita is in charge of her diet, clothing and other organisation aspects. Her brother Shravan still bowls to her in the nets. Her first major breakthrough came in October 2013 when she became the first Indian woman to achieve a double-hundred in a one-day game. In a game against Gujarat where she was playing for Maharashtra, she scored an unbeaten 224 off just 150 balls in the West Zone Under-19 Tournament, at the Alembic Cricket Ground in Vadodara. After making her One Day Internationals debut in 2013 in a match against Bangladesh, Mandhana made her Test debut in August 2014 against England at Wormsley Park. She helped her team win the match by scoring 22 and 51 in her first and second innings, respectively. In the second ODI game of India's tour of Australia in 2016 at the Bellerive Oval in Hobart, Mandhana scored her maiden international hundred (102 off 109 balls) but the match ended in a losing cause for India. Mandhana was also the only Indian player to be named in the ICC Women's Team of the Year 2016. 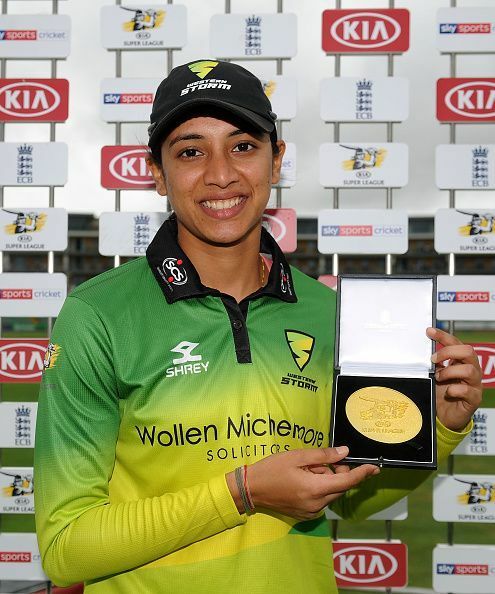 Mandhana came into the team for the 2017 World Cup after recovering from an injury she sustained, an anterior cruciate ligament rupture, during her time at the WBBL in January that year. In her five-month recovery period, she missed the World Cup Qualifier and the Quadrangular Series in South Africa. She began the World Cup with a 90 against England in Derby, in the first of the group matches. She helped her team win by 35 runs, and was named the player of the match. followed by her second hundred in a One Day International against West Indies (106*). In September 2016, Mandhana signed up a one-year deal with Brisbane Heat for the Women's Big Bash League (WBBL) along with Harmanpreet Kaur and became one of the first two Indians to be signed up for the League. Playing against Melbourne Renegades in January 2017, she fell awkwardly while fielding after bowling the final ball of her over hurting one of her knee which ruled her out of the rest of the tournament. She ended that season with after scoring 89 runs in 12 innings. In June 2018, Mandhana signed for Kia Super League defending champions Western Storm and became the first Indian to play in this league. In March 2018, she broke her own record of scoring the fastest fifty for India in a Women's Twenty20 International (WT20I) fixture, taking just 25 balls in the opening match of the tournament against England. Her previous record came against Australia women in the 2017–18 India women's Tri-Nation Series where she took 30 balls to reach a half-century.